Üsküdar University’s 2. TEDx Conference! It is observed that communication, which has central preserve in every aspect of human and social life, takes on the role of engine power as social change and transformation parallel to the developments in information technologies. In our world of information age, communication is dominant not only in the present but also in the form of the future and it reveals how important and necessary communication education is. 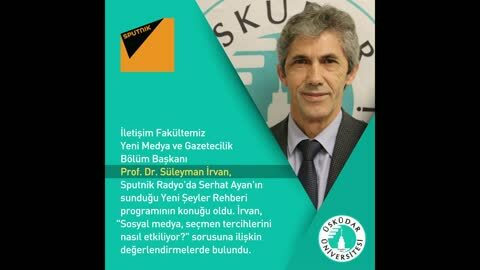 Üsküdar University Faculty of Communication has also undertaken the task of raising qualified communicators with well-trained academic staff, equipped with state-of-the-art physical facilities and an educational and training program suited to its mission and vision. The Faculty of Communication, which started its education in three departments as Communication Science, Advertising Design and Communication, New Media in 2013-2014 academic year, added Media and Communication, Radio Television and Cinema, New Media and Journalism, Visual Communication Design, Advertising Design and Communication in 2015 - 20164 and lastly added of Public Relations in 2016-2017. Üsküdar University Faculty of Communication is completed in five years, with a total of four years undergraduate education, one year of English preparatory study. Students who do not want to take English preparatory courses complete their undergraduate education in four years. The curriculum at Üsküdar University Faculty of Communication, which provides four-year undergraduate education in addition to English preparation, has been prepared in order to have a solid intellectual basis and to acquire necessary knowledge in professional terms. In the first two years of undergraduate education at Üsküdar University Faculty of Communication, general scientific formation courses are mainly given, and within the next two years, the emphasis is given to the professional courses required by the department. Thus, at the end of four years, the student has both a solid intellectual formation and professional knowledge and knowledge in communication.